The course aims to contribute to increased collaboration between the participants and contribute to realizing the ambitions of the ACGG program: increase smallholder chicken productivity in Africa. Participants in the course will become familiar with the ACGG program and establish a network. Participants are expected to benefit from not only the material covered in the course but also the network while working on their research project in their home country. Have a basic understanding of R software – a language and environment for statistical computing and graphics. Understand the structure of datasets obtained from breeding programs. Be able to process, quality check and clean up datasets for genetic analysis. Understand the modelling of fixed and random effects in mixed linear models applied to genetic evaluation. Understand the use of a relationship matrix in a mixed model. Be able to perform analyses with the different software packages used in the course. Be able to apply the hands-on experience with genetic evaluations from the course to their own research projects. Coordinators for this course are Tadelle Dessie (ILRI) and Hans Komen (WUR) while the teachers include John Bastiaansen and Hans Komen from Wageningen University and Raphael Mrode from ILRI. The course will focus on data analysis and mixed models applied to data from chicken, but the theory and skills are equally relevant for other species. 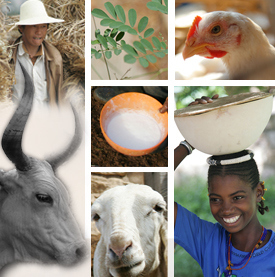 Participants are required to have a basic understanding of animal breeding and basic statistics. Preferable participants have an MSc degree related to animal breeding and genetics. No prior knowledge of the software R is required. The maximum number of participants is 30. Activities will include lectures, practical exercises, applying the knowledge to the analysis of a real dataset; presentation and discussion on solutions of exercises. A reader will be prepared covering material and assignments, spanning the domain of the course. Participants should bring their personal computers if available, but computers and installed software for exercises will be provided at the course location if required. In addition to the 15 participants from Tanzania, Nigeria and Ethiopia (ACGG countries), 15 international students are also accepted for the course. The course costs a total of 500 USD + air ticket. The 500 USD covers accommodation (6 nights + breakfast), conferencing (including lunch), and other logistics. Please read the call carefully and apply no later than the 15th February, 2016 – Midnight (CET). Please include in your application your CV and a cover letter outlining the application of this course to your studies and/or work. Please send all applications to Ayda Tegenu (a.tegenu@cgiar.org) and copied to Jasmine Bruno (j.bruno@cgiar.org). For any further questions and clarification on the course content, contact Tadelle Dessie (t.dessie@cgiar.org) and Jasmine Bruno (j.bruno@cgiar.org). Tags: data, modeling. Bookmark the permalink.